BEIJING — It’s the evening before filming starts, but director Lu Zhan and her main actor, Yang Zhenguo, can’t agree on what the script is really trying to say. Is “Summer” a gay movie? “It’s a love story that just happens to be between two young men,” Lu says, sitting on one of the beds in Yang’s hotel room. “Summer,” a short film project by students at Communication University of China in Beijing, tells the story of two young men working in a noodle shop who develop feelings for each other. To Yang, the script seems straightforward: Both characters are unequivocally gay. “That’s only in your eyes,” Lu responds. In her mind, Yang’s character, Dongzi, is straight, and Ah Zhen, his maybe-love interest, is bisexual. A long silence follows while Lu and Yang mull over the script. Yang Zhiyuan’s crew, some of whom are his friends who are volunteering as actors and makeup artists to keep the budget small, have gathered in the Beijing suburb of Tongzhou for four days of shooting. It’s a small production for a short film that might not have much of a viewership outside of campus. But the story’s themes mean that the movie is a statement of sorts. It’s not just Yang Zhiyuan’s teachers who are cautious with LGBT content. In April, gay romance blockbuster “Call Me By Your Name” was pulled from its scheduled screening at the Beijing International Film Festival. A month later, the European Broadcasting Union terminated its partnership with China’s Mango TV after the station cut and blurred out gay-themed content from its broadcast of the Eurovision singing contest. Industry guidelines for TV shows and online content say to avoid depicting homosexuality. On the other hand, China’s LGBT community has become more visible and vocal. In April, microblogging site Weibo deleted accounts and posts with “comics and graphic short videos of homosexuality.” But after an outcry from its users — both LGBT individuals and allies — Weibo canceled the purge. In the same month, authorities approved “Looking for Rohmer” for nationwide release — the first gay-themed film to achieve this. On the first day of the “Summer” shoot, one of the scheduled scenes is the story’s climax. It takes place on a roof near the noodle shop owned by Ah Zhen’s father, where 18-year-old Ah Zhen has started working after finishing vocational school. Dongzi, a 21-year-old university student who works in the shop for the summer, suddenly hugs Ah Zhen from behind through a bedsheet that has been hung up to dry. The two end up dancing on the rooftop, tenderly and awkwardly. Cai Rongchen, a Beijing Dance Academy sophomore who plays Ah Zhen, thinks “Summer” is about youthful innocence and discovery. “Both characters are in the process of searching for their identities,” he tells Sixth Tone. 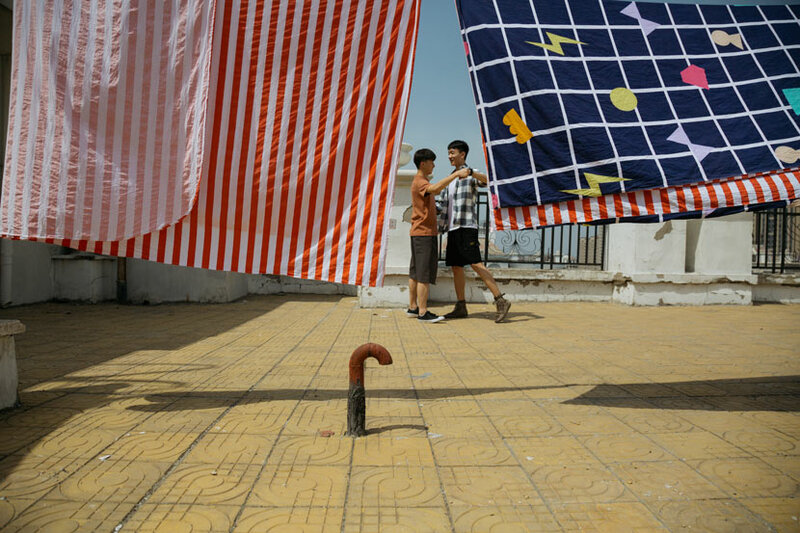 At the start of the 15-minute film, Ah Zhen narrates: “I always thought each summer was the same, days spent between a boy and a girl. But that summer, everything was a little … different.” Initially, Ah Zhen is attracted to a local girl, and Dongzi — who sees himself as a relationship expert — gives Ah Zhen advice on how to woo her. But sparks soon seem to fly in a different direction. To Cai, Ah Zhen isn’t sure about his sexual orientation until he meets Dongzi — an experience to which Cai can relate. When he was younger, he, too, was interested in girls. 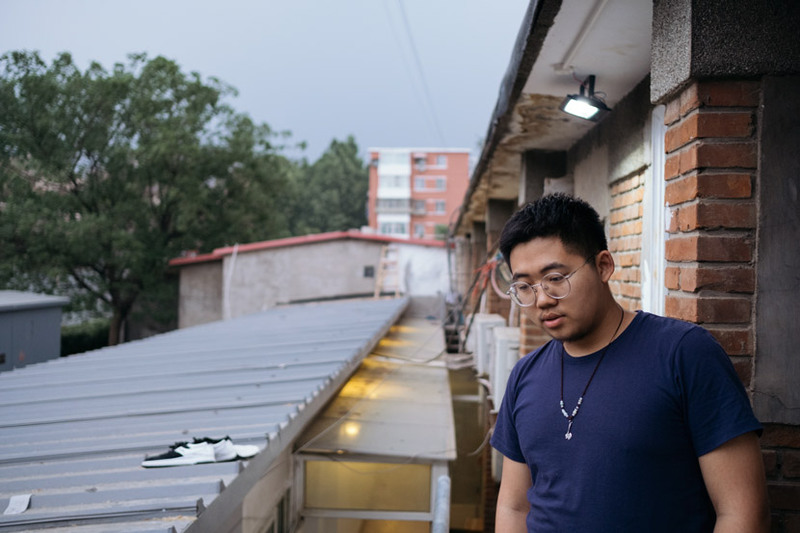 But two years ago, after befriending a gay man, Cai became involved in the LGBT community in his hometown in eastern China’s Shandong province and gradually realized that he was gay, too. “I did have some feelings toward boys at school before, but I didn’t know what it was,” he says. One of Cai’s favorite films is “Brokeback Mountain,” which he watched before he became aware of his attraction to men — and before he knew that the movie was about gay love. “What they have is beautiful, as I’ve always believed love has nothing to do with gender,” he says. In that movie, the main characters keep their relationship a secret, afraid of the inevitable disapproval. “Summer” doesn’t deal with such themes — to the disappointment of one crew member. “She holds the idea that all gay films should contain discrimination from society, family standing in the way, self-denial, and lack of self-awareness, but I really don’t think it’s necessary,” writer-producer Yang Zhiyuan says. Students at Communication University of China, one of the country’s best art universities, tell Sixth Tone that the percentage of LGBT students enrolled there seems higher than at other schools, though there are no numbers to verify this. Homophobia persists at schools around China, but at the university, most LGBT students have come out without any discrimination from their peers or faculty, students say. “I chose this school partially because the LGBT students are treated equally on campus,” says Yang Zhiyuan, who identifies as gay. All of Yang Zhiyuan’s movies depict gay themes. His first short film, a comedy, was drawn from personal experience: It centers on a gay man who is looking for a place to relax while waiting for his next train, and who then steps into a bathhouse that offers massages. The female masseuse gives him plenty of sexually tinted hints that service options extend beyond what is advertised, but the man, oblivious, fails to pick up on them. The masseuse eventually gives up, assuming he has erectile dysfunction. Yang Zhiyuan’s second short film is a love story between a student and an office worker. They live together, but their relationship struggles as they keep their love a secret outside the house. The office worker is not out at work and never introduces the student as his boyfriend. This article was published on Sixth Tone. This entry was posted in Culture, Education and tagged GAYMOVIE, LGBT by Yiying Fan. Bookmark the permalink.